﻿ A Story a Week : Go for the Golden! Sometimes, when sitting down to write one of these stories, I have to look over my list of story ideas, but on other occasions, that isn't necessary at all - the story jumps up and begs ... write me, write me! ... And so it is today. I have to write about something that happened to me on the day that I wrote the previous story (about my daughter and insects). 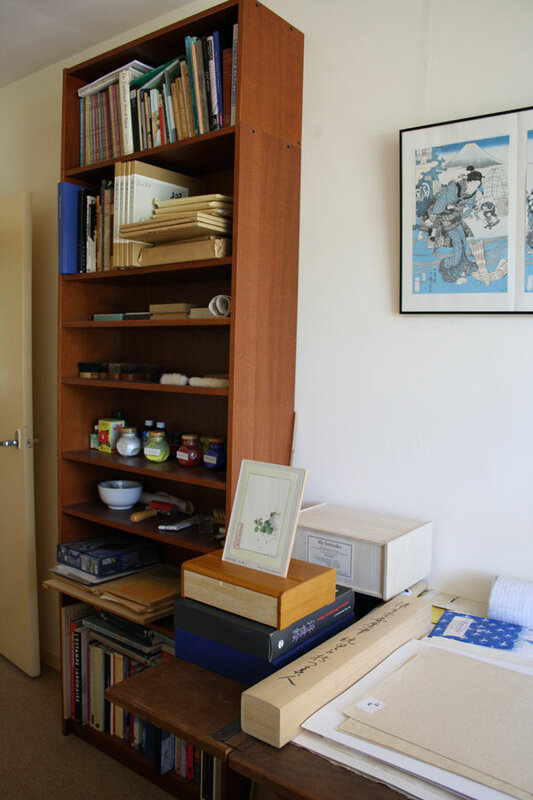 Jacques owns a number of books on prints and printmaking, and as he knew that these would be of great interest to me, he included in the photo a nearby large bookcase, stretching from floor to ceiling, full of books on printmaking (along with some tools and supplies). I was indeed interested in these, but what caught my eye first were not any of the print books, but a set of 16 books in a row - a bit blurred in the image - right up at the top of the bookcase, the place you might normally put books that are not in regular daily use, but which you want to keep visible and in your mind. Do you see what has happened? 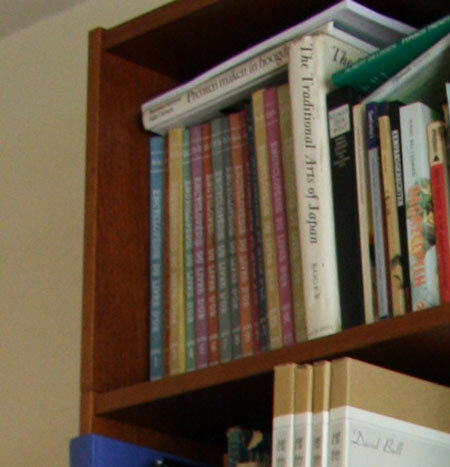 Yes, the set of books in Jacques' photograph is the same set of books about which I had written my story the night before, and which I haven't seen in more than half a century. Here they were again, coming back to me two days in a row - this time in a 'random' snapshot taken on the other side of the planet! This seems coincidental beyond belief! When a golf ball lands on a blade of grass on the fairway, what an incredibly rare chance it is - to land on that particular blade of grass! But of course it must land somewhere - the trick would come if you were to try and choose in advance on which blade! But even though I know this background on how a 'coincidence' works, it still remains astonishing. For my friend Jacques to have owned the same set of books, to be trying out a new camera just now, to have decided to shoot the photo in a different room from where he would normally have taken it (he said in a letter, "Actually, this is not the room where I normally display your prints"), and for him to have sent it to me the very week (the very day!) that I prepared that particular story out of all the hundreds that I have written ... It just seems completely impossible that such a thing could happen. All is not perfect though, as the gods who arrange such coincidences slipped up a bit along the way this time! My set was 'The Golden Book Encyclopedia', but Jacques' is the 'Encyclopédie Du Livre D'or' ... the French edition. I very much enjoyed reading (and listening to) this story, especially because it exactly describes what really happened! Of course it does Jacques! There is no fiction in any of these stories - I don't have that much imagination!